I don't want to come across as disrespectful. I am very familiar with this Torah from R' Shlomo as he is one of our Rebbes (he was the Rebbe of R' Asher Stoliner and R' Mordechai Lechovitcher, both of whom were grandparents of the first Koidenover Rebbe) and have said it over in public on a number of occasions. And, although I do not claim to be an expert by any means, I am familiar with the context. contains mussar and b) the deveikus and kedusha one gets from learning would lead one to Hashem's ratzon and not sin do make sense, let us look at the context of this statment in Beis Aharon. The Beis Aharon, R' Aharon II of Karlin, the son of R Asher Stoliner who was R Shlomo Karliner's talmid, quotes the aformentioned statement from R' Shlomo and then goes on to explain the reason, "Hashem created man straight (yashar), therefore a person should only want to do what is shayach to Hashem. However, because of the yetzer hara and the foolishness that a person does, a person becomes perverted and does not want to follow the straight path . . . but when we learn Gemara b'iyun we take ourselves to the sechel hayashar, for this is in truth the sechel hayashar (the Gemara), and through this we become yashar and when we become yashar we no longer desire but what Hashem wants." [Please look inside Shabbos Shuvah, page 271 as this is not necessarily a professional translation]. Put in this context, we have a different understanding of what he meant. Does this mean we shouldn't learn mussar? Not necessarily. R' Shlomo is just saying that Gemara b'iyun is the best because it straightens out our sechel so that we will once again naturally do what Hashem wants. Great post! I think that Rafi's second statement is pretty deep. In an ideal world, Mishna and Gemara would be all that we need. 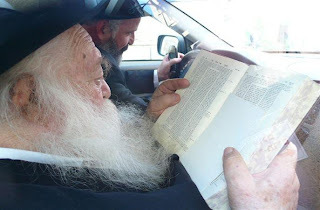 As we, from a generational point, move further away from Kabbalas HaTorah, we need other ways to connect and transmit to, as Rafi put it to "Hashem directly through the Torah". One can easily say that looking at Nach for mussar or even Chumash might be more of direct source of mussar. How many people would have thought 15-20 years ago that people would be connecting to Torah via the internet? Rabbi Slatkin - you explained it much better than I did. Shkoyach! Neil - I am not so sure deriving it from the chumash and navi is even more direct. Torah She Baal Peh was given at the same tim as she b'chtav. So the gemara is really on equal footing, I think, with the chumash, in that regard..
perhaps simply the bitul involved in putting the knowledge contained in the Gemara before one's own intellect is in itself all the mussar one needs.. i think this might just be restating both RafiG's point and R' Slatkin's in different words. "It is true that there were many religious people who merited to repair their middos, and rise to great heights, even without these techniques, only through the study of torah and fixed prayers. And it is written so in the book "Keneses Yisrael" from the holy Rabbi Yisrael from Meruzin. However this is so only for those who have pure souls from birth due to the holiness of their fathers and the holiness of their souls. And they were not dirtied through the sins of youth. Or it was due to the help of some great tzadik who washed the stains of their sins, and shined in them through his great and holy level. But without this, it is a difficult and far away matter, as experience will testify that a person will be capable of fixing his middos without great study of mussar , contemplation, and introspection every day as we've explained above."